The European Commission has given the green light for €50m of public funding to the Lithuanian state-owned operator “Plačiajuostis internetas” to extend its network. The money will be used to establish a backhaul network (used to link the core backbone of the network to smaller subnetworks) in remote rural areas of Lithuania, enabling the deployment of faster download speeds of at least 30 megabits per second. The scheme is aligned with the European Commission’s Digital Single Market Agenda and its 2025 objectives to reach high speed connectivity across the EU, as set out in the EC’s Communication on a Gigabit Society (published Oct 2016). The European Commission will provide up to €30m to develop digital service infrastructure, with projects on a Safer Internet, eIdentification, and a pan-EU platform for showcasing Europe’s cultural treasures called Europeana. 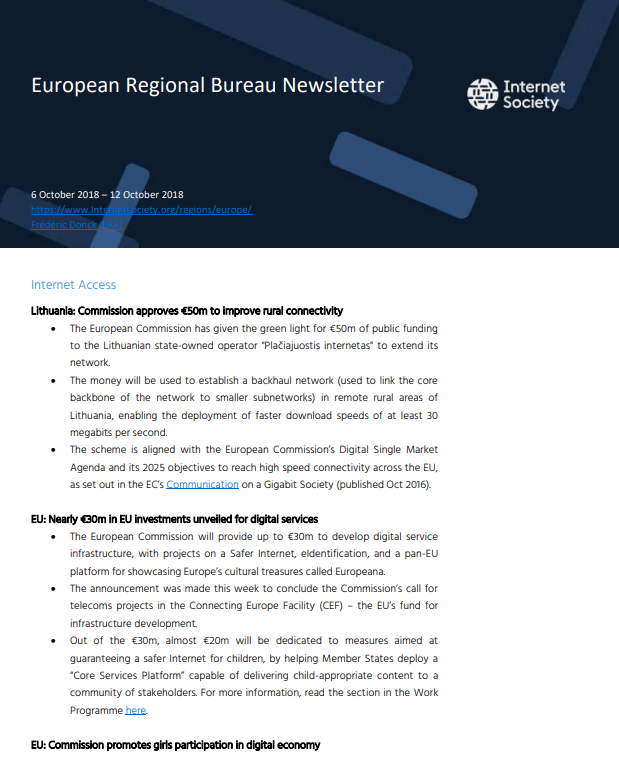 The announcement was made this week to conclude the Commission’s call for telecoms projects in the Connecting Europe Facility (CEF) – the EU’s fund for infrastructure development. Out of the €30m, almost €20m will be dedicated to measures aimed at guaranteeing a safer Internet for children, by helping Member States deploy a “Core Services Platform” capable of delivering child-appropriate content to a community of stakeholders. For more information, read the section in the Work Programme here. As part of the International Day of the Girl Child, Mariya Gabriel, Commissioner for Digital Economy and Society, stressed that women remain underrepresented in European tech and more work in needed to improve the participation of girls. Earlier this year, Commissioner Gabriel marked International Women’s Day (March 6 2018) by outlining her Women in Digital Strategy, with actions to combat gender stereotypes and promote role models, promote the uptake of science and maths subjects, and encourage more women to participate in digital entrepreneurship. BSI claims that, even though new major waves of ransomware attacks did not materialise in the most recent year, this remained a large threat. The report notes that increased digitisation and networking of IT systems in Germany means that cybersecurity threats are becoming increasingly complex. In its press release, the BSI points towards its own role in maintaining an integrated value chain of cybersecurity in response to this threat. In an interview with Politico, Commission Vice President for the Digital Single Market Andrus Ansip named cybersecurity among the Commission’s top priorities going forwards. Ansip emphasised the importance of the attribution of cyberattacks during the next European elections. Other priorities named by the Vice President include Artificial Intelligence and data flows. The Parliament has now named the MEPs that will lead the drafting of its position on terrorist content within the Civil Liberties Committee. The initial proposal from the Commission, released in September 2018, lays down new rules mandating among other things that platforms take down uploaded terrorist content within one hour of it being flagged by national competent authorities. MEP Helga Stevens (ECR) was named as the Parliament’s rapporteur on the subject. Shadow rapporteurs are: Rachida Dati (EPP), Josef Weidenholzer (S&D), Maite Pagazaurtundúa Ruiz (ALDE), and Eva Joly (Greens). Marina Kaljurand, Chair of the Global Commission on the Stability of Cyberspace has warned that countries need to step up their work and cooperation on cyberspace. Kaljurand made reference to a draft declaration reportedly developed by France which aims to get countries to act together to protect cyberspace. Kaljurand also criticised the reluctance of some countries to come out with political statements in response to cyber attacks such as WannaCry. Ahead of the International Conference of Data Protection and Privacy Commissioners, Giovanni Buttarelli, the European Data Protection Supervisor published a blog post on debating ethics in the digital age. Buttarelli presented the conference as a way to kick-start the debate on what is right and wrong in the development of digital technology. He mentioned as particular concerns addiction to new devices and software, child safety online, and the use of social media platforms to spread propaganda. The Conference will run from 22-26 October in Brussels and speakers will include Apple CEO Tim Cook and founder of the World Wide Web Tim Berners-Lee. The European Commissioner for Competition told MEPs this week that she would continue probing Google over potential breaches of EU anti-trust law related to the company’s specialised search. The Competition Commissioner’s admission is further evidence of the difficulty competition authorities are having in finding a single, or universal approach, to regulating the Internet’s biggest companies. Following the landmark ruling on the Google shopping services case, many commentators hoped a remedy had been found for all other search services, from local to travel and maps.